NOTICE: Activation key must be used on a valid Steam account, requires internet connection. ABOUT THE GAME	Darkness. And then there was light… but not enough for Michael to find out who he is and what happened to the world out there. The “Great Wave”, the “dissolved”... are just hollow words in his looted mind. Help Michael face a dying reality, a universe that’s fading away. Face a… merciless world that gets sick and vanishes. Face no past, no present, no future. Face the impending moment of “dead synchronicity”.And you’d better hurry. Because, otherwise... what will you do when Time dissolves itself? A terrible pandemic is turning all of humanity into “the dissolved” - the sick whose deliria provide them with supernatural cognitive powers... but also steer them towards a gruesome death. The root of this illness seems to be “the Great Wave”, an inexplicable chain of natural disasters that destroyed all energy sources and communications and plunged the world into a chaos ruthlessly controlled by both the authorities and the army alike. Michael, a man with no past, will have to recover his identity and decode the events that brought the world to the edge of collapse. 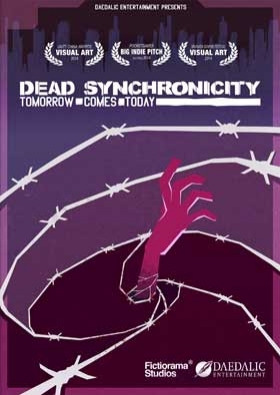 Because,if he doesn’t hurry, he won’t be able to avoid the impending moment of “dead synchronicity”, when Time itself dissolves… Dead Synchronicity: Tomorrow Comes Today is a point and click adventure that features a stunning dystopian plot, a distinctive, expressionist 2Dart style, and an atmospheric soundtrack.KEY FEATURES Classic adventure gameplay combined with mature theme 2D graphics featuring a unique, expressionist style	Space-time distortions, a dystopian atmosphere... and a dark, bloodstained plot	Featuring soundtrack from indie rock band Kovalski	Guybrush meets Mad Max meets 12 Monkeys SYSTEM REQUIREMENTS Windows Minimum OS: Windows XP 32 Bit Processor: 2 GHz Dual Core CPU Memory: 2 GB RAM (4 GB RAM for Windows Vista or higher) Graphics: Nvidia GeForce 8600 GS, ATI Radeon HD 3470 DirectX: Version 9.0c Hard Drive: 4.5 GB available space Sound Card: DirectX 9.0c Compatible Sound Card with Latest Drivers Additional Notes: Using the Minimum Configuration, we strongly recommend to use minimal settings in order to not experience low frame rates. Recommended OS: Windows Vista SP2, Windows 7 SP1, Windows 8 (32/64 bits versions) Processor: 2.6 Ghz Dual Core CPU Memory: 4 GB RAM Graphics: Nvidia GeForce GT 610, ATI Radeon HD 4650 Series or higher DirectX: Version 9.0c Hard Drive: 4.5 GB available space Sound Card: DirectX 9.0c Compatible Sound Card with Latest Drivers	Mac	Minimum Hardware: Mac from 2008 oder newer with 2 GHz CPU, 2GB RAM, 4.5GB HDD OS: Mac OS X 10.7 CPU: 2.0 GHz RAM: 2 GB Graphics: Any HDD: 4.5 GB Sound: Any	Recommended OS: Mac OS X 10.9 CPU: 2.5 GHz RAM: 4 GB Graphics: Nvidia Gforce GS/GT600 Series or AMD Radeon HD 4000 Series HDD: 4.5 GB Sound: Any © 2014 Daedalic Entertainment GmbH and FICTIORAMA Studios.Daedalic and the Daedalic-Logo are trademarks of Daedalic Entertainment GmbH.All rights reserved.